I call Tom Allen in the Seattle office of Fraser Yachts to check the details of the sale of his central listing, the 34.1m megayacht Safari Escape and Tom tells me that it was an in-house deal with no other brokers involved. Built by Lloyds Ships in 1983, she was last refitted in 2001 and was asking $1.295 million. Safari Escape accommodates as many as 12 guests in a master, VIP, two doubles and two twins - an extraordinary number for a 34m yacht. Tom says, "That's what clinched the deal. She has the best use of space I've seen in a boat this size." 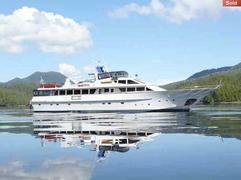 The new owner intends to change her name and move her to the Bahamas where she'll be available for charter.